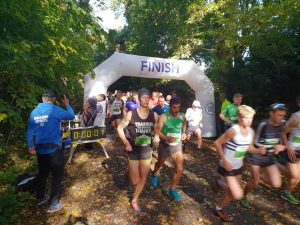 The 10th Titsey Trail 10k race was another sell-out with 450 runners signing up to participate. This was the first Titsey Trail 10K race to be jointly organised by Oxted Runners and Holland Sports AC. Oxted Runners are very appreciative of Holland Sports AC’s involvement in the Titsey Trail 10K, which has provided the race with additional resources and new ideas to help maintain the Titsey Trail 10K’s repute as Surrey’s “Must-Do” Trail race for runners of all calibre. This year’s race was considered to be a ‘dry’ race, even with the long deluge of rain on the course, the day before. The field consisted of 377 runners, comprising of 173 female runners and 204 male runners. Congratulations to Ryan Evans of South London Harriers who was overall winner of the event and set a new course record, of 34 minutes, 30 seconds, a minute ahead of second place. The fastest lady was Debbie Jackson, of Collingwood AC, in a time of 41 minutes, 17 seconds, nearly a minute ahead of the second place lady. Well done to everyone who participated and we hope to see you again next year.